Apple iPhone 8, one of the most awaiting smartphone which already had tons of leaks and rumors is ready to launch next month. So friend, here we came with exclusive round-up of nearly accurate leaks and rumors of Apple iPhone 8. There has been A LOT of talk, leaks, and speculation about the iPhone 8 for, well… as long as most of us can remember. The handset will be the first time Apple has changed its industrial design since 2014, however, so the hype was always going to be off the charts. In all likelihood Apple is preparing to unveil not one, not two, but three new iPhones at its keynote in September, the exact date of which has yet to be revealed. In addition to upgrades to the current iPhone 7 and 7 Plus, Apple is expected to launch a totally new model equipped with exclusive technologies to mark the tenth anniversary of the world’s leading smartphone. The future iPhone range could feature phones in three sizes: 4.7 inches, 5.5 inches and 5.8 inches. If so, the new 5.8-inch model, an unprecedented format for Apple, could be equipped with an edge-to-edge OLED display. The year 2017 (June the 29th, to be precise) marks the 10th anniversary of the release of the iPhone, and it’s believed that Apple has a blockbuster of a redesign up its sleeve to celebrate. Here’s what else we expect from the new design, and the leaked images we’ve seen to back it all up. The iPhone 8 will, more than likely, feature an A11 chip, built on ARM’s highly-efficient 10nm manufacturing process, and run the next version of Apple’s mobile operating system, iOS 11. Wireless charging has become a common feature of some Android smartphones – including Samsung’s latest family of devices – although it is still a lot slower than wired charging methods. A report in Bloomberg in January claimed that Apple was working on “cutting edge” wireless technology that would allow future iPhones and iPads to be placed further away from charging mats than current smartphones. The unnamed sources said Apple was working on overcoming “technical barriers including loss of power over distance,” and that the technology will feature in iPhones coming out in 2017. Now pictures have been leaked on Chinese social networking site Weibo by a Foxconn employee, providing a look at the inside of Apple’s OLED iPhone. The pictures show a large, central black spot, which represents the device’s wireless charging coil, according to MacRumours. KGI analyst Ming-Chi Kuo claims that Apple’s dual-camera system will remain exclusive to the larger “Plus” model. “While an attractive addition for avid picture takers and professional photographers, the iPhone 7 Plus dual-camera is not a mass-market killer application yet,” Kuo says in the note seen by Apple Insider and 9to5Mac . However, Kuo thinks that Apple’s next iPhone could come with a “revolutionary” new selfie camera that uses infrared technology to detect the location and depth of objects in its field of vision. The 3D camera system could be used for facial recognition, iris recognition and 3D selfies. It could also be used in augmented reality mobile games, to accurately replace a character’s head with that of the user, Kuo wrote in a research report seen by 9to5mac . One of the stand-out features of Samsung’s latest flagship smartphone, the Galaxy S8, is facial recognition technology, allowing users to unlock their phone by simply looking at it. Now eagle-eyed software engineers have found evidence that the same feature could be included in Apple’s iPhone 8, by scouring through the code for one of Apple’s other gadgets . The HomePod speaker is Apple’s version of the Amazon Echo or Google Home and is set to be launched in December 2017. As the speaker needs to work seamlessly with Apple’s new phones, the firmware code contains references to some upcoming features that Apple fans can expect to see. Revealed on Twitter by developer Steve Troughton-Smith it appears the next iPhone will include an infrared camera that could be used to scan your face, even in the dark. It’s likely this technology will be included so users can unlock the phone just by looking at it – in a similar way to Samsung’s Galaxy S8 smartphone. Meanwhile, an earlier report from Chinese-language website MoneyDJ.com , picked up by Digitimes, suggests that Apple may be planning to introduce iris recognition technology with the iPhone 8. Apple’s iPhone 7 is water-resistant to a depth of one metre for up to 30 minutes – a rating known as IP67, which is the same as the Apple Watch . IP67 means it will survive a dip in the sink or down the loo, and it won’t break if you pour a drink over it, but you probably don’t want to take it swimming. Apple’s next top-of-the-range iPhone could come with an accessory worth £160 in the box. According to a new report from analysts at JPMorgan, seen by 9to5Mac, the iPhone 8 may come bundled with a free pair of AirPods. The wireless earphones were announced along with the iPhone 7 and went on sale just before Christmas. They currently cost £159 to buy in the Apple Store. The AirPods link up to your iPhone or Apple Watch via Bluetooth. They use sensors to automatically detect when they are in your ears, and play or pause your music accordingly. They contain a pair of microphones, so you can control your music, change the volume and check your battery life using Siri. The AirPods deliver up to 5 hours of listening time on one charge, and come in a special case that doubles as a charger, offering more than 24 hours of listening time in total. That covers design. But what new features should we expect in the iPhone 8? The loss of the Home button means the Touch ID fingerprint scanner is in design limbo – with separate theories claiming it will move to the back of the device, or be embedded under the glass, or be removed entirely. But many of its functions may be replaced by a new feature tentatively known as Face ID. The HomePod firmware mentioned earlier contains references to facial recognition and expression detection that could be used to unlock the device. Face detection/unlock has been expected for a while. Back in December 2014, USPTO awarded Apple a patent relating to a “personal computing device control using face detection and recognition”, and US Patent 20170076077, published in March 2017, describes a method for “Locking and unlocking a mobile device using facial recognition”. DigiTimes has predicted that Apple is likely to launch iPhones equipped with iris-recognition technology in 2018; but at the end of August 2016 the site went further, reporting that Taiwan-based Xintec is expected to provide iris scanners to Apple for the iPhone launching in 2017. And unlocking the phone might not be the only thing facial recognition is used for. Code in the HomePod firmware leak indicates that it will also be able to authenticate Apple Pay and be accessible to third-party apps; and that it will also serve to mute notifications if the user is perceived to be ‘paying attention’ already. Apple debuted ARKit at WWDC 2017, showcasing how developers can implement AR abilities into iPads and iPhones. Surely the iPhone 8 will arrive with cool new features that take advantage of that? We previously spotted an Apple patent application that appears to back up all this speculation. Patent 9,488,488, for ‘Augmented reality maps’, describes the use of a mobile device to view live video of whatever is in front of the user, and to then superimpose images related to nearby places of interest on top of the video. Apple has been offering wireless (inductive) charging for a while now on the Apple Watch, and we’re hearing increasingly confident predictions that the feature will come to the iPhone in 2017. One strong hint came from Robert Hwang, the CEO of Apple manufacturer Wistron, who (in an apparent slip-up) said “new features like waterproof and wireless charging” will appear in the next generation of Apple handsets; and SlashLeaks has posted what it says is the charging coil that will be used to deliver this feature. Also Read:- What is bitcoin and how to get started with bitcoin? Let’s understand it! The iPhone 8 is likely to be announced in September 2017, marking 10 years since the firm launched its first smartphone. However, one report claims that it might not be available to buy until the fourth quarter, noting that the iPhone 8 may be available in limited quantity only. A note by analyst Timothy Arcuri from Cowen and Company has added weight to this and claims that production could be delayed due to issues with its Touch ID sensor. Another report suggests the iPhone 8 may not arrive until 2018. A research Deutsche Bank, picked up by Business Insider, claims the smartphone won’t make it onto shelves this year due to supply chain issues and “technical challenges”. As if just to confuse matters more, Digitimes is reporting that mass production of the iPhone 8 is on schedule and that the smartphone will see a release in October. If it’s anything like Apple’s new MacBooks, next year’s iPhone will be more expensive than this year’s release, and some are claiming that the highest-spec model will be the first iPhone to cost more than $1,000. A new report at Forbes claims that pricing could start at an eye-watering $1,100 to $1,200, with Apple to offer the handset in 128GB and 256GB configurations only. Interest is evidently focused on this device. To begin with, what will it be called: the “iPhone 8”, the “iPhone Edition”, or something else altogether? With only a few weeks to go, specialized websites have already published supposedly leaked photos and technical specs. 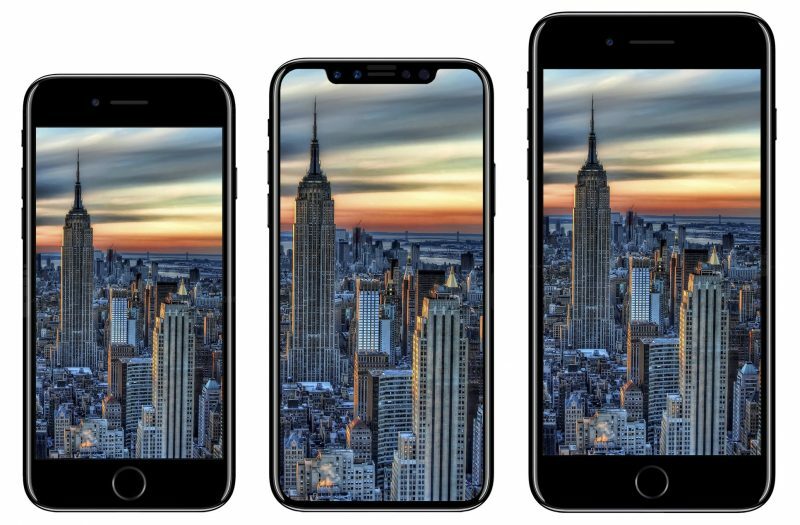 If these are to be believed, Apple aims to provide the new model with a 5.8-inch display mounted on a body that would normally accommodate a 4.7-inch screen. In other words, the display would cover nearly the entire facade of the phone. Given that a range of sensors are usually located in the lower part of the face, there may be a fingerprint reader under the screen, or perhaps the “Home” button will be axed. As for photo capability, the future iPhone is expected to have dual rear cameras, similar to the iPhone 7 Plus’s, but with new filming options. Both front and back cameras are expected to be capable of recording 4K video. On track for augmented reality? The device that the media have dubbed the “iPhone 8” may also benefit from a wireless magnetic charging system. This technology, already used in the Apple Watch, is said to be high on users’ wishlists. Finally, the new iPhone might come equipped with 3D facial recognition sensors, a feature that would serve not only to unlock the device, but also to validate Apple Pay and App Store purchases. The launch date for the extraordinary new iPhone remains uncertain, but it is expected that the upgraded iPhone 7s and 7s Plus will, as usual, go on sale some ten days after the keynote. Some analysts believe that the three models will all be released at the same time, but that the new device will only be available in a very limited edition, while others predict a separate fall launch. All the new iPhones are expected to be equipped with the new A11 processor, which is faster and uses less power than the current A10. So friend, here we came at the end of the rumor roundup of Apple iPhone 8. I Hope you clearly took a look at all the leaks, specifications and features introducing in Apple iPhone 8. What do you think? Will iPhone 8 proved to be highest rated and best selling smartphone of 2017? Let’s give your opinion through comments. And if you have any other query, drop a comment below and we will take care of your valuable comment. Build Best, Stay Cool!